The Osprey Hikelite is one of their newest, and perhaps best packs. It was released only a few months ago and is already popular amongst day hikers. Of course, it includes a lot of features on other Osprey favorites you may have already checked out, but the Hikelite has some unique and helpful features you are going to love, especially if you hike or do other outdoor sports. Should You Get The Osprey Hikelite? You might also think that there would be a big difference in their prices, but there actually isn't. The price largely depends on the color you choose, and in some instances, the 26L backpacks is cheaper than the 18L one. With that in mind, you really won’t have to give up any cool features if you opt for the smaller version. Now, let’s take a look at what exactly those cool features are! This is one of the main selling points of this backpack. Both versions of the Hikelite are incredibly lightweight, which is particularly important because after all, this is a hiking backpack. You really don’t need any excess weight on your shoulders when hiking, right? One way Osprey managed to keep this backpack so lightweight is that they removed some features that we loved on the Daylite. The padded laptop sleeve, for example, is something you won’t find on the Hikelite. But, as you don't normally take my laptop on hikes, it's not a big issue. Osprey’s new line of backpacks for spring 2018 is all about the ventilation. This backpack features a ventilated mesh back panel, that allows for excellent airflow while you’re on the move. And, this particular feature is a definite improvement on the ventilation system of the smaller cousin: the Osprey Daylite. Although to be forgiving of the Daylite, it was not meant as a pure hiking pack. Raise your hands if you’ve ever used your backpack to shield yourself from the pouring rain (I’m raising mine!). Well, Osprey was thoughtful enough to include a rain cover with the Hikelite. This is an excellent addition for all of us that don’t let a bit of water stop us from enjoying the outdoors. And, the rain cover is cleverly hidden in a pocket on the bottom of the backpack. It is also removable, so if you want that extra space at the bottom, you can take it out too. You all know how important it is to stay hydrated during any outdoor activity (or, you should now). Well, it’s good news that both Hikelite backpacks are perfectly compatible the Osprey Hydraulics reservoir. Additionally, both the smaller and the larger pack can fit almost any reservoir up to a 3L capacity. And they also feature an internal hydration sleeve. Unfortunately, I also have some bad news. The reservoir doesn’t come with this backpack (they rarely do), and if you want to use this feature, you’ll have to purchase it separately. I guess it’s a good way to allow people to keep their options open. And, in reality, most other hiking packs don't come with hydration reservoirs either (including the Deuter, Osprey's German competitor!). After all, some people prefer water bottles. I also use this section of my packs for my laptop or electronics when commuting or traveling. 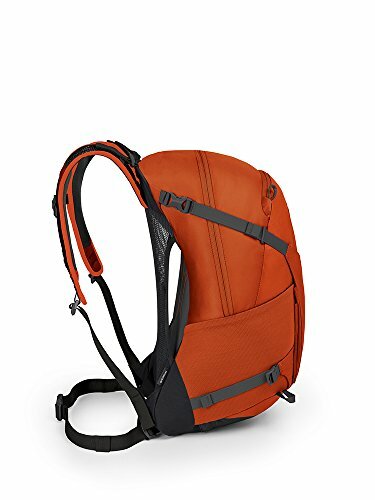 So, a hiking pack like this might be great for sports, but it can also double as a daily pack too. It just lacks the specific organisation features of something like an Osprey Nebula. These features are found on almost every Osprey backpack, so it’s no surprise that we also find the on the Hikelite. And honestly, these features are one of the main reasons why I seem to own more Ospreys than I definitely need. But, before I discovered them, I always struggled with the straps of my backpack falling off because I have slim shoulders. If you also suffer from fragile shoulders, you will love these features as much as I do. The sternum strap will ensure that the shoulders straps don’t budge an inch, and they definitely won’t be able to fall off. They also come with an emergency whistle that you can blow, you know, in the case of an emergency. The webbing hipbelt is removable and highly adjustable, so you can make it fit you perfectly. So, if you were ever worried about your backpack staying in place while you’re on the go, the Hikelite really is a great choice. The compression straps on the side actually perform a few different functions on the Hikelite. Obviously, their main purpose is to further secure the load of your backpack, but on the larger version of the backpack, they also keep the upper part of the front "shove-it" pocket in place. Oh, and more thing about this particular pocket – it’s great for when you want to quickly stash a spare clothing item (or helmet), but don’t really want to be bothered by opening the main compartment of the backpack. Or, if it’s a wet jacket, you don’t want to put it next to the rest of your dry things! Smart, huh? Back to the compression straps. On the Hikelite, these also double as a walking pole attachment point, which is another improvement on some older hiking backpacks Osprey made. You can see how that is supposed to work in the picture. 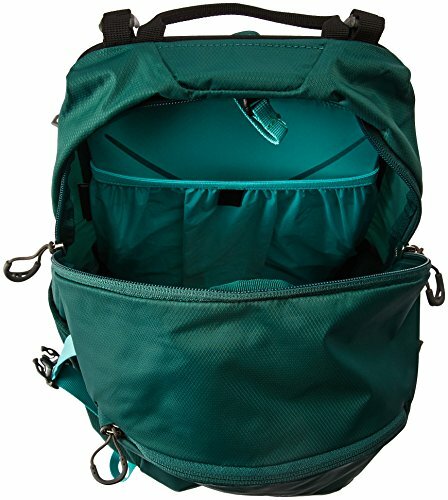 The larger version of this backpack (26L) has an additional set of compression straps, and they go over the side mesh pockets. These straps help keep the shove-it pocket in place, which is why they are not features on the smaller backpack. These pockets appear to be another improvement over the Daylite. Now, I actually read several reviews about the Daylite backpack where people complained about items just falling out of the side stretch pockets. With the Hikelite, they are positioned differently, which explains their better functionality. The side mesh pockets are designed to hold water bottles, so that you can easily access them while you’re out and about. They can fit a 1L bottle at best (on each side), which is, in my opinion, perfectly suitable for one hiking trip. 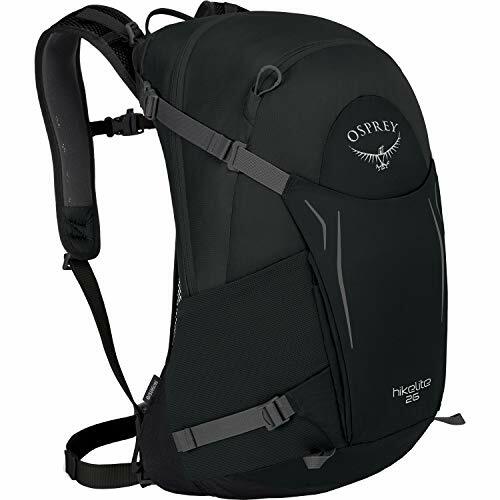 And, if you can actually fit 2 liters of water in the side pockets of your backpack, then you don’t really need the additional purchase of the Osprey water bladder. I might have mentioned already that I’m a fan of zippered pockets on all types of gear. And, particularly the ones that promise to keep my phone safe, which is exactly what the scratch-free pocket of the Hikelite is promising. It can also keep safe any other smaller items you would want to have more easily accessible; your sunglasses and wallet for example. The key attachment clip is also in this front pocket, and I love it. The main reason why is because I have a tendency to put my keys in the same pocket as my phone, and I saw the error of my ways when I did that with a phone that didn’t have Gorilla Glass protection. Ouch! With this attachment clip, your keys will stay in the upper part of the pocket; a safe distance from your (probably) expensive smartphone’s display. Another smart feature from Osprey. If you go hiking often, then yes, definitely get the Hikelite. It has a ton of cool features that will make your hiking trips more enjoyable, such as the integrated rain cover and the compression straps that double as trekking pole attachments. Depending on the amount of things you tend to bring along with you on your hikes, and your overall height, you get to choose between two different sizes of the Hikelite backpack. And, the best part is that there are not really that much differences between them; the larger backpack has a front shove-it pocket and an additional pair of compression straps, and that’s about it. The rest is just volume. 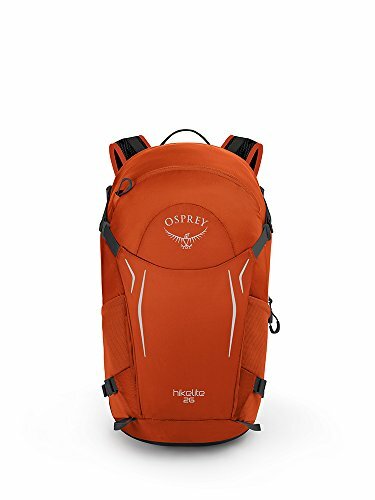 On the other hand, if you are looking for a different Osprey backpack, perhaps more suitable for your day-to-day needs, I would suggest going for something more practical. Check out my review of these anti-theft backpacks instead, as they are a better option for everyday use. 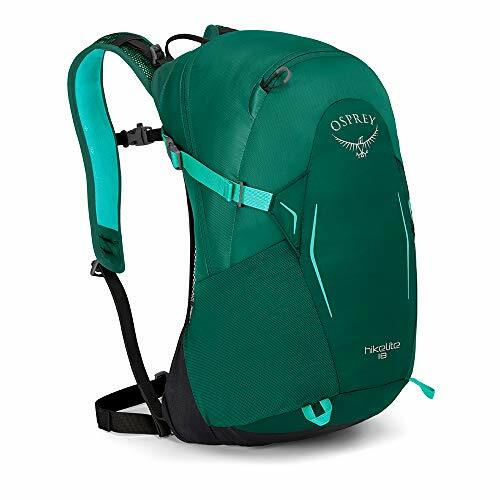 But, for all of you that loved the Osprey Hikelite, head over to Amazon to get an awesome deal on any one of the 6 different colors this backpack comes in.